T-Mobile(s tmus) CEO John Legere and CTO Neville Ray got up on stage at CES on Wednesday and made the claim that with 17.8 Mbps of downlink speed they now run the fastest LTE network in the country. If they had made that statement a few months ago or a year from now, there would have been no doubt in mind that they were right. But today I think they’re engaging in some selective number picking. T-Mobile’s networks today would beat any other U.S. operator’s network hands down if they traveled backwards in time a few months. Then T-Mobile, Verizon Wireless(s vz)(s vod) and AT&T(s t) all had networks of comparable bandwidth, and by virtue of the fact that T-Mobile’s is still relatively unloaded, its customers would have experienced speeds far in excess of what Ma Bell and Big Red could provide. But in the interim Verizon has launched its LTE monster in major markets across the country, doubling or tripling its network capacity and in many markets doubling its potential 4G speeds. There have been no comprehensive speed tests on the new network yet, but initial reports in NYC showed it clocking 80 Mbps. As the network becomes loaded, average speeds will be less, but certainly higher than the 14.3 Mbps T-Mobile is giving Verizon credit for. Based on the description Ray gave at CES, though, I don’t get the impression T-Mobile sampled any of these new Verizon networks in its analysis of Ookla’s Speedtest.net results. Ray did mention Verizon’s new souped-up networks in his talk, but he pointed out that only newer Verizon smartphones could access that new network. 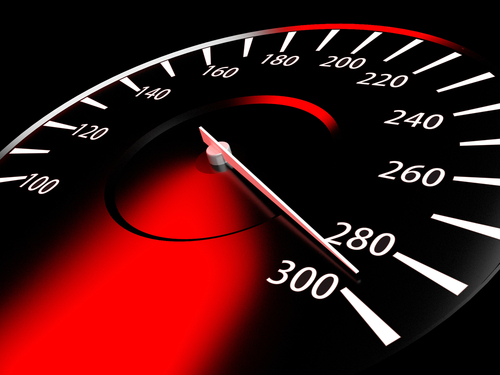 Meanwhile, Ray said all T-Mobile LTE phones could support its top speeds. That’s true. At the end of the year of about 20 percent of Verizon’s smartphone base could access it’s improved networks, but these aren’t insignificant devices – including the iPhone(a aapl) 5s and 5c, the Samsung Galaxy S4, the Motorola(s goog) Droid Maxx, Mini and Ultra – and the list is growing quickly. Ray’s point that Verizon has left millions of customers with older smartphones in the lurch, though, is a bit disingenuous. T-Mobile’s network has only been live since March. By default all of T-Mobile’s LTE handsets are new. You could make the argument that there are still millions of T-Mobile customers with only year-old HSPA+ handsets that can’t access its new LTE networks, and that those customers are just as screwed as Verizon’s. Ray can’t just ignore Verizon’s massive network upgrade simply because it suits T-Mobile’s marketing purposes. If you’re looking for speed, you’ll get no argument from me that T-Mobile has one of the fastest networks in the country. In some places and on many devices it probably has the fastest. But if you’re the type of person who absolutely needs to have the fastest connection, you’re likely also the type of person who has the latest and greatest phone. And if that’s the case you’re most likely going to find that fastest connection on a Verizon network. At least you will today. Over the next year, T-Mobile is deploying an LTE monster of its own — it’s already live in Dallas — and once it’s live all are bets are off. That network will host 40 MHz of spectrum in 22 of the countries 25 largest markets, making it the same size of Verizon’s new LTE beast. Given T-Mobile is much smaller than Verizon, though, it will have far fewer customers vying for that bandwidth. T-Mobile is practically a shoe-in to assume that speed crown. T-Mobile has set itself up as an anti-carrier, defining itself by what other carriers are not. I applaud its chutzpah, but that attitude has also led it to make carnival barker-like statements such as today’s: We’re fast while those other peckers are just slow! (Legere actually used the word “pecker.”) If T-Mobile wants to ignore the subtleties of today’s networks, that’s fine — everyone else does — but it should at least wait until its arguments are airtight before making them. It’s funny that they said that because somebody or even so “rumors” are going around saying that T-mobile is going to down from the fastest 4g lte network to the slowest network. That’s funny at my house verizon typically gets mid 30’s through speedtest.net, just checked it again to verify and it was 35.44Mbps, way better than what t-hobo is pedaling, it is even better than my dsl through centurylink they only get me 10 Mbps, wish i didn’t have a limit on my 4g i would use it and drop my home internet. oh and Att, they don’t have enough service in my town to even get online so they don’t even count. Haven’t seen how t-hobo does at my house, but my guess is not to well. Sorry but I don’t buy the argument for LTE for any subscribers with AT&T, T-Mobile and their MVNOs that have HSPA+ compatible devices. At the end of the day, my daughter’s Samsung S3 non-LTE version gets 15.5mbps down and 2.86mbps up on the Solavei network which does not even support 4G LTE yet. I have had lines on both Sprint and Verizon’s 3G EVDO networks and even Sprint’s WiMAX network prior to this one. I also have an iPhone 5s using T-Mobile’s 4G LTE service. The differences between today’s LTE and HSDPA+ speeds is negligible at this time. I wish I could say that about the plan and device cost differences. I got 38.69 mbps down, 18.39 mbps up on T-Mobile in San Diego using the Ookla speed test Android app. I consistently Average 38-40Mbps LTE on T-Mobile in Metro Detroit area suburbs. TMO’s marketing angle here is fantastic. So they’re the 3rd largest network, with a whole lot of saber-rattling to do. If you’re looking for best coverage, well, that’s Verizon’s game. If you want a proper GSM handset so it works in other countries (and allows you to switch to other GSM providers in the US) then you’re looking at AT&T and TMO. If you want SERO/cheap then you are likely a Sprint fan. So by making a potentially flame bait statement about being “THE fastest” network, they get people talking about speed comparisons. So they win or lose, but given their sparse network utlitzaion (hey they’re building it so we’ll come), the numbers are usually close or good for them. What this does is rule out any concern a switcher to TMO would have about data speeds. TMO is certainly cheaper than AT&T or VZ, and by attempting to claim the speed crown, they’re well-positioned (in a data perspective) against Sprint which is oversubscribed. If myth busters had an episode devoted to this subject, no matter what the outcome, it would likely make Legere cream his pants. You seem to focus on MB/s but that’s not speed it’s “flow rate”. Given the prices for mobile data it’s not often that customers transfer large files that reach the highest flow rates for a significant amount of time so measuring speed by max flow rate is pretty pointless. Maybe you should consider not promoting this misleading system of measuring “speeds”. There are two other sides on this triangle, coverage and reliability and TMO doesn’t exactly light up the map if you know what I mean. Here again, Verizon seems to have the edge. Of course, this is a very dynamic conversation, so a single point in time is not representative of the how things will be six months from now, but Verizon seems to have a pretty strong position. It’s faster than what it takes GigaOM Mobile site to load when on wifi , please somebody fix this! Getting the same in San Fran, Jason! Quite the appropriate critical analysis, on your part. Chicago Sprint best Sprint, I can get faster than 17.8Mbps down. So can I in S. Palm Beach FL. Yes Sprint LTE! 39.8 in Salem Oregon T mobile! To discover the average speeds encountered by actual users running the Opensignal App, go to Opensignal.com and investigate your own city..pull the ‘Advanced View’ slide-tab, and see the speeds reported by users. Since TMO has focused LTE in urban/suburban areas in the past year, you will discover they average a bit higher in downloads in most major cities. Churn will eventually even things out until the 20×20 service rolls out. Sorry you feel that way, Anon, but we’ve given T-Mobile plenty of credit for the amazing stuff they’ve accomplished in the last year. I felt a little bad about writing this because as far as CTOs go, Neville Ray is tops in my book. 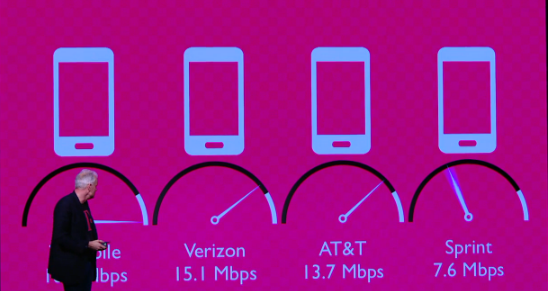 But when T-Mo launched HSPA+ before anyone else, I called them the fastest. When they launched dual-carrier, I called them the fastest. Well, Verizon has a 40 MHz network compared to T-Mo’s 20 MHz network today. I’m sorry, but in this case, T-Mobile is not the fastest. It’s pure physics.